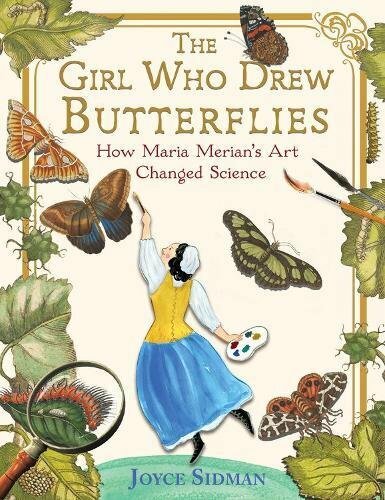 A beautifully crafted middle grades biography of a girl who drew butterflies back in the 1600s, changing the study of natural history in the process. The Girl Who Drew Butterflies: How Maria Merian’s Art Changed Science by Joyce Sidman. HMH Books, 2018. 160 pages. Leading scientists still believed in spontaneous generation; Maria was carefully gathering caterpillars, meticulously documenting their metamorphoses with her beautiful illustrations. In the 1600s, not only did most people still believe butterflies and moths spontaneously generated, they believed insects were dirty, women unfit for scholarly inquiry or paid work, and that the new world was a paradise on earth. Maria learned the trade of an engraver while working in her family’s print shop. She was a talented artist, and her close companions overlooked her quirky habitat of constantly collecting insects. Maria helped change science forever, even though she was a woman who was interested in bugs in a time when both bugs and women were looked down upon. Sidman’s text is straightforward, informative, and interesting. Explanatory excerpts on scientific practices, religion in the time period, and more offer helpful insight. Sidman makes it clear that Maria defied the strict views in her day regarding women, femininity, and science. The book doesn’t read like an agenda-driven biography, though. Readers will come away with a renewed appreciation for the patience required by real scientific inquiry and the single-minded pursuit Maria possessed. Notably, this single-minded pursuit aided science, but not Maria’s personal life. The visual presentation of the book is its most striking feature. Reproductions of Maria’s art, woodcuts and other visuals from the time period bring the story to life. Back matter includes further helpful resources. It’s clear that Maria viewed the abundance of life around her as created life, but Sidman doesn’t explore the nuances of Maria’s faith. Next PostLearning to Lead: Another RedeemedReader Booklist!